Alzheimer's is a horrific disease. One I know about all too well. But there's breakthroughs all the time in research looking to fight it. 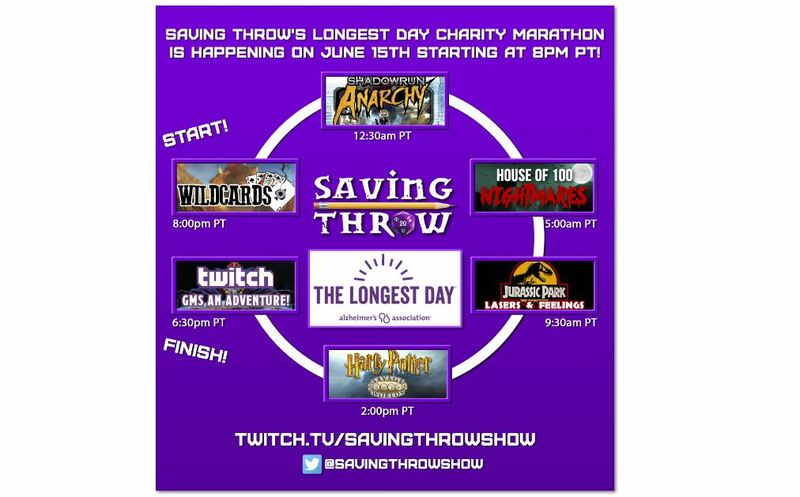 Saving Throw is looking to do their part to help out by holding The Longest Day, their 24-hour RPG marathon that will be streamed out on Twitch, as well as their funding drive. Go and check it out and toss a couple bucks their way in order to help save people's lives and memories. The Longest Day is an annual worldwide charity event hosted by the Alzheimer’s Association, where people pledge to engage in all sorts of activities on the longest day of the year in an effort to raise money for Alzheimer’s awareness, support, and research. Saving Throw has participated in years past raising almost $7,000 in 2017, and plans to do even more this year with their 24-hour tabletop RPG marathon, “Saving Throw vs. ALZ”, which starts at 8 pm PT on June 15th continuing through to 8 pm PT on June 16th. They’ll be playing a wide range of role-playing games and also sharing information about Alzheimer’s disease and what you can do to help fight it. Throughout the stream, viewers will be able to make donations to the Alzheimer’s Association, and those donations will unlock rewards and events that will affect the games being played. These games include Deadlands: Reloaded, Dread, Shadowrun: Anarchy, a homebrewed Savage Harry Potter game, Jurassic Park Lasers & Feelings culminating in a raucous session of Twitch GMs. Rerolls for the players, healing, story events, and more will all be unlocked as they raise funds to fight Alzheimer’s. There will also be huge giveaways, fun surprises, and special guests! Additionally, using the hashtag #SlayALZ on Twitter and Instagram, the Saving Throw team will be collecting stories of those affected by the disease to help raise awareness and share the impact it’s had on the community. While some of the leading causes of death (cancer, heart disease, etc.) are declining, Alzheimer’s disease is on the rise, and increasing awareness and raising money for research are two of the biggest things needed to help end this cruel disease. If you want to tune in and help #ENDALZ with a bunch of performers, improvisers, and all-around awesome gamers, tune in to twitch.tv/savingthrowshow at 8 pm PT on June 15th, 2018! For more information, you can check out their donation website and watch the stream at https://tiltify.com/@savingthrowshow/savingthrow-vs-alz or follow Saving Throw on Twitter @savingthrowshow.